The la ndscape story this walk explores is about the Oaks Estate precinct viewed as an assemblage of intrinsic features of the built and natural environments. 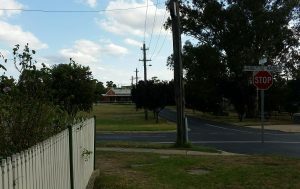 The presence of the Molonglo and Queanbeyan Rivers in association with the landholdings, including “The Oaks” (1836), “the Robertsons’ house” (c.1912) the Queanbeyan Railway Station, “Hazelbrook”, and many in between, provide key interpretative landmarks. En masse they demonstrate significant social history and the influence of the natural environment on the developing landscape. Pre-dating the building of Queanbeyan and Canberra, the story of the earliest tracks, streets and buildings of Oaks Estate tells of Aboriginal displacement, colonial exploration, subsequent settlement and significant regional development. The etching of the ACT-NSW State and Territory border onto the landscape changed the story’s focus away from grazing and rural industry towards the establishment of the federal capital city. As the city expands the story of the Oaks Estate precinct continues to evolve in its own unique way. The walk includes a short visit to the Robertsons’ house (external areas only) and to “the Oaks” (gardens only). Dr Karen Williams is author of Oaks Estate-No Man’s Land and has lead several walks for the National Trust, interpreting the cultural landscape of Oaks Estate as interconnected natural, social and built environments. Meet: Gillespie Park, corner of Railway and River Streets, Oaks Estate. On street parking (or you can park on the paddock on the opposite side of River Street from Gillespie Park). Length and terrain: Approx. 1.6 km, at easy walking pace. This walk is primarily along Oaks Estate streets and walking will be on relatively flat ground, except for the moderately long incline of River Street. Most of the walking surface includes roadway, paved paths and grassy verges. However, there will be a short section of informal track to traverse. Part of the informal track will cross a slashed paddock and includes river corridor, formed steps leading up and down either side of moderately steep creek banks. Please carry drinking water and wear closed-in walking shoes, hat and adequate sun protection.